1] . The right place to discuss a controversial paper containing serious errors and biases is the journal in which it was published. Unfortunately, for political (and not scientific) reasons, this is not always possible. On the very reasons for which this was not permitted, please contact us. Interestingly, the Atmospheric Environment journal is hosted by the University of East Anglia (School of Environmental Sciences). It is noteworthy that the Climate Research Unit of this institution was recently hacked by individuals who succeeded in revealing how dissenting views are silenced and blocked . “Waterpipegate” refers to one of the other numerous ethical scientific scandals involving the World Health Organisation [3-6]. Nancy [*] Daher N, Saleh R, Jaroudi E, Sheheitli H, Badr T, Sepetdjian E, Al-Rashidi M, Saliba N, Shihadeh A. Comparison of carcinogen, carbon monoxide, and ultrafine particle emissions from narghile waterpipe and cigarette smoking: Sidestream smoke measurements and assessment of second-hand smoke emission factors. Atmospheric Environment 2010; 44(1): 8-14. Peter Kelemen (Columbia University’s Department of Earth and Environmental Sciences). Oxman AD, Lavis JN, Fretheim A. Use of evidence in WHO recommendations. Lancet. 2007 Jun 2;369(9576):1883-9. Girard M. World Health Organization Vaccine Recommendations: Scientific Flaws, or Criminal Misconduct? Journal of American Physicians and Surgeons 2006;11(1):22-3. The use of smoking machines has always posed serious problems when it comes to assessing the toxicity of mainstream smoke (the one –from cigarette or hookah (shisha, narghile)- actually inhaled by the smoker). International recommendations have sometimes been issued to deter researchers from resorting to such methods. When it come to side-stream smoke, the picture becomes even more complex as confusion grows in the context of prohibiting all forms of smoking, from public hospitalities (cafes, including hookah lounges) to homes, cars, and even public squares and gardens. The recent US-American University of Beirut experimental study on toxic emissions from narghile smoking, whose open objective is to provide a scientific caution for such moves, is marred with a certain number of biases that need to be corrected by its authors. These biases relate to :1) non-observance of special charcoal full-ignition time; 2) use of an unrealistic smoking machine; 3) perturbations brought to natural ageing and dilution of smoke ; 4) irrelevant comparison with a “light” cigarette ; 5) inadequate presentation and comparison of yields of emitted toxic chemicals; 6) slanted bibliography. The article concludes that the scientific credibility of public health regarding ““waterpipe”” oriented research may be jeopardised by the dissemination of statements lacking the scientific rigour needed in this field. Against the complex globalised background of the renewed interest in hookah smoking, harm reduction strategies remain the most efficient approach. The US-American University of Beirut (US-AUB) experimental study on toxic emissions from narghile smoking refers to a so-called “controversy” which has led its authors to publish findings that would justify that “public smoking bans must include the ““waterpipe””(Daher et al., 2009). Unfortunately, no mention of the source of the so-called “controversy” is given while it is in fact a comprehensive critical evaluation of peer-reviewed publications, including reports from international public health agencies, on hookah (shisha, narghile) smoking. The objective of this important document was to clear up a world confusion that even led some organisations to use manipulated images showing a huge, though inexistent in the real world, visible plume of side-stream smoke stemming from a hookah. It was therefore necessary to clarify that many researchers have erroneously taken exhaled mainstream smoke for side-stream smoke. It should be noted that in this field efforts have often been geared towards justifying the relevance of national smoking bans, particularly in the USA, the UK and France. The long overdue critique aimed to review what sound science says about this environmental tobacco smoke and the charcoal contribution in overall pollution. Consequently, the source of the so-called “controversy” proved to be a commendable intent to put an end to a world confusion (Chaouachi, 2009a). It remains that Daher et al.’ recent paper is actually marred with a certain number of biases that also need to be outlined. The latter relate to :1) non-observance of special charcoal full-ignition time; 2) use of an unrealistic smoking machine; 3) perturbations brought to natural ageing and dilution of smoke ; 4) irrelevant comparison with a “light” cigarette ; 5) inadequate presentation and comparison of yields of emitted toxic chemicals; 6) slanted bibliography. 1. Non-observance of special charcoal full-ignition time. In the US-AUB experiment, the charcoal was placed atop the bowl of the hookah only 1 minute further to its ignition (Daher et al., 2009). In fact, this charcoal is of the quick self -lighting type, i.e. non natural and is even of the poorest quality type presently available in the market. This means that, given its peculiarities (particularly its typical crackling at the beginning), it was still in its ignition phase which actually takes up to several minutes during which the concentration of particles is particularly high than over the following minutes. Since the US-AUB authors also cite a German study on indoor air contamination by hookah smoking, it should be stressed that, similarly, the latter did not take into account the importance of this ignition phase during which the charcoal is usually kept outside for 8 to 10 minutes. This study contains an interesting colour graph showing that the serious methodological bias was the same (Fromme et al., 2009). It should also be noted that the German study was carried out in unrealistic conditions whereby 4 consecutive human smoking sessions of 40 min each took place in a non-ventilated room (the windows and the door were kept closed). On one hand, this certainly poses a serious ethical problem with respect to the protection of human subjects (Chaouachi, 2009b). On the other, the researchers found (just to take one category of toxic chemicals)“concentrations of probable carcinogenic PAH during the session in indoor air which were 2.6 times higher than on the control day“. This figure being that of 4 consecutive smoking sessions, this means that even if such an experiment had been realistic, the concentrations for only one session prove to be even smaller than in the non-smoking condition. 2. Use of an unrealistic smoking machine. The US-AUB study on narghile side-stream smoke is not based on measurements on human subjects smoking in a natural environment or in a laboratory realistically simulating conditions of the social world. First of all, and this is the most striking bias, it relies on an unrealistic smoking machine that has been criticised for its numerous flaws and its underlying smoking topography to start with (Chaouachi, 2009b). Globally taken, the “yields of toxicants” produced by this machine are generally very different, sometimes several times fold, from actual intake by humans. The case of “tar” is a an excellent example. The variations betweenin situmeasurements (with all the suspected biases) reach sometimes 50%. An average value (from existing studies across the world) for the amount of tar produced by moassel (tobacco-molasses based mixture) smoking might be 250 mg. However, any watchful researcher should immediately add that this is hookah “tar”,i.e.one produced at very low temperatures and, most importantly, mainly made up of glycerol. Few non-tobacco researchers know that the figures for tar advertised here and there include he high proportion of glycerol. 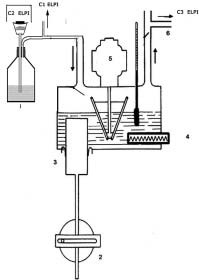 Averaging a one-hour long human complex behaviour (hookah smoking) through the use of a laboratory model in which a same gesture (drawing a puff) is extracted every 17s over a full hour –and, marginally, the charcoal on the same position above the bowl- is a serious distortion of reality. Indeed, cigarette smoking machines –from which puffs are, however, extracted every 60 s for only a few minutes-, have been criticised, including by WHO tobacco experts, for giving a biased image of what real smoking is (Chaouachi, 2009b). A recent laboratory experiment on human subjects, co-authored by one of the US-AUB authors, confirms this critique whereby, despite methodological biases, an average inter-puff interval of 43 s was found (Eissenberg & Shihadeh, 2009). If the same US-AUB smoking machine were set with this parameter or, to be more realistic, 60s or 120s -as historic studies systematically dismissed in the ““waterpipe”” literature (El-Aasar et al., 1991a,b; Sanghvi, 1981) have shown-, a great amount of the same literature would have no value anymore since the yields of toxic chemicals (“tar”, etc.) would be completely different from those published (Chaouachi, 2009b). Indeed, recent measurements of biomarkers of highly carcinogenous chemicals in body fluids of shisha smokers in Germany support the findings based on the above-mentioned smoking machines set with a different inter-puff interval. They are also in agreement with the much lower CEA levels (a cancer marker) found in the blood of hookah smokers who have been smoking for decades very important amounts of tobacco (the weight equivalent of 60 cigarettes in each bowl and each session)(Sajid et al., 2007, 2008). In this German study, the levels of a series of toxic and carcinogenic substances (namely: cadmium, lead, chromate, arsenic, metabolites of benzene, polycyclic aromatic hydrocarbons, acrolein, acrylamide) were not higher than among cigarette smokers and, most of the time, not very different from controls. Even the level of NNAL, metabolite of the potent carcinogen NNK, was not different from that of controls. The researcher, who presented these results at an international conference of antismoking organisations in 2009, stated that they were “disappoint[ing] from a scientific point of view” (Schulz et al., 2009). 3. Perturbations brought to natural ageing and dilution of smoke. Three details are very important. First, in the US-AUB experiment, the side-stream smoke was routed from the tunnel to a 1 m3 Teflon box for analysis. This cannot be considered as a model reflecting the reality of environmental smoke. Second, the 17s inter-puff interval (over a full hour) does not allow for natural ageing and dilution as hookah smokers in natural environments quite frequently stop smoking for several minutes. As previously said, this fact has a tremendous impact on the chemical composition of both mainstream smoke and second-hand smoke as a whole. Third, and this is the most important point, the size (67 cm height; 24 cm diameter) of the tunnel designed to collect the side-stream smoke shows that the pipe was of a small-size, also known to generate more CO than a medium or tall one (Sajid. et al., 1993). Apparently, the same tunnel was used for the cigarette tested for comparison. However, the length of a cigarette is about 10 cm and its volume is much less important than that of a portly hookah. This means that if the latter was about 50 cm high (as the set-up shows), the dimensions of the tunnel were strikingly disproportionate (a 5/1 ratio for height only). The dilution process was therefore different in each case (cigarette and narghile), hence resulting in biased comparisons between yields. Then, another problem is not to know if the smoking mixture could risk being consumed more rapidly, as the paper suggests, but that the use of such a narrow tunnel may also induce many unexpected chemical reactions inside the bowl. The high level of CO collected certainly bear some relation with this bias. As a consequence of such a setup, the US-AUB researchers expectedly found an average number of particles(<560nm) of 4.38 10 12 for the narghilevs.1.68 10 12 for one cigarette. However, in a similar study, strangely not cited by Daher et al., other researchers relied on a sinusoidal pump and simulated water pipe smoking in conditions “close to users’ habits” (Becquemin et al., 2008). They used an electrical low pressure impactor sorting particle numbers and size according to 12 classes ranging from 0.028 to10 µm in diameter. Interestingly, and because they used an open tunnel that allowed a more realistic dilution of smoke, they found, in the side-stream smoke, a concentration of particles that was about 6 times higher in cigarette smoke than in narghile smoke (19 10 6 /mlvs.2.91 10 6 /ml). 4. Irrelevant comparison with a “light” cigarette.The US-AUB paper states that the ventilation holes of the cigarette used for comparison were not blocked. Such a configuration is therefore identical to that of a biased experimental study by the US-Syrian Centre for Tobacco Studies (also cited by the US-AUB) in which a cigarette (“Gauloise Light”) was used for the same comparative purpose. The only explanation given by its authors was that this type of cigarette was the one preferred by the subjects (Maziak et al., 2008). However, in both cases, previous studies have shown that light cigarettes produce much less particles so the comparison is necessarily flawed and obviously in favour of cigarettes (Chaouachi, 2009a; Bernstein, 2004). 5. Presentation and comparison of yields of emitted toxic chemicals. In the German study on hookah indoor air contamination, based on 4 successive smoking sessions by humans in a non-ventilated room for 4 hours (Fromme et al., 2009), the ambient CO was 48 ppm, i.e. a concentration of 60 mg/m3. Without even discussing their results against those of the available literature, the US-AUB authors state that they found for only one hookah session, an average of 2,269 mgvs.65.4 mg for one cigarette. Obviously, the corresponding volumes of smoke, in both cases, should have been highlighted, not to mention the above-discussed bias about the disproportionate tunnel. Concerning particles, Daher et al.’s following statement is unacceptable :“It can be seen that even during the first 5 minutes, the total particle concentration in the chamber is greater for the waterpipe than for the cigarette case (i.e. even if the waterpipe were to be smoked for only 5 minutes, it would emit a larger number of particles into the environment than a cigarette)”.Indeed, as previously showed, the particle concentration was quite high because the charcoal was still in its ignition phase (and should not have been placed atop the hookah bowl only 1 min after its lighting but much later). As for two selected carcinogenic PAHs (benzo[a]pyrene and indeno[1,2,3-cd]pyrene), the German study with human subjects found, in extreme and unrealistic conditions, an average of, respectively: 0.61 ng/m3 and 1.90 ng/m3 (Fromme et al., 2009). Astoundingly, the US-AUB team found 155 ng and 322 ng respectively (for about 30 l of total smoke) and, while this study was cited by the authors, no discussion of such discrepancies was offered. 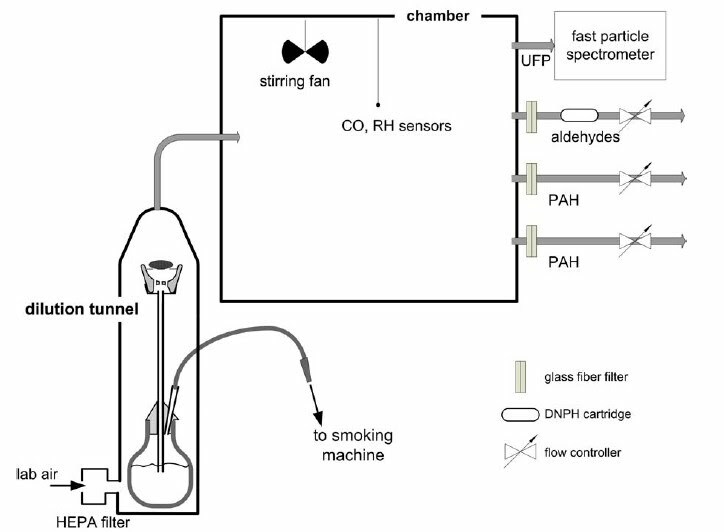 Finally, as if the smoking machine gave a good image of smoking in the real life, Daher et al. state without, any linguistic precaution, that: “a single waterpipe smoking session emits in the SS approximately 4 times the PAH and aldehydes, 5 times the ultrafine particles, and about 35 times the carbon monoxide emitted in the SS of a single cigarette”. To be correct, they should write that their artificial simulator has emitted this or that quantity of toxic substances, not that “a water pipe session emits..” as if there were a consensus over these facts. This is unacceptable, particularly when measures are so different from those obtained in another peer-reviewed although not cited study (Becquemin et al., 2008)[image, left]. 6. Bibliographical bias. Most of the results are in contradiction with experiments run in natural environments. Many relevant peer-reviewed studies were not cited by the authors. As for the ones selected by the authors, most of them were criticised for other striking flaws (Chaouachi, 2009a). For example, concerning the issue at stake (passive smoking and the necessity seen by the authors to scientifically support more smoking bans), the US-AUB authors cite the 2006 US Surgeon General’s report without stating that this document has actually omitted the mention of one of the few most important studies in this field (Enstrom, 2007). As for the first comprehensive critical review on this issue in relation to hookah smoking itself (Chaouachi, 2009a), it has been brushed aside as anonymous “controversy”. 1. Ventilation.Most hookah users are aware that the charcoal is toxic, and particular the one (self quick-lighting type) launched in the market over the last decade. They are also very watchful about ventilation. Thanks to the latter, hookah smoking -active or passive (huge clouds of exhaled mainstream smoke intermixed with side stream charcoal particles)- has not posed any public health problem in the world for centuries. The findings of the German study on hookah indoor pollution (tobacco and charcoal), in spite of its extreme conditions, confirm this fact (Fromme et al., 2009). Indeed, only this way can one understand that traditional coffee houses in Asia and Africa or modern hookah lounges in Europe and the USA can sometimes be packed with dozens of narghiles emitting clouds of smoke intermixing with smoke from cigarettes. How could people inside (non-smokers or smokers alike) stand such a “stuffy” atmosphere for hours if the US-AUB yields of toxic chemicals were those actually inhaled ? The answer to this enigma is: ventilation. 2. Avoiding quick conclusions. The US-AUB authors conclude that“during a typical one-hour waterpipe use session [,] a waterpipe smoker likely generates ambient carcinogens and toxicants equivalent to 2–10 cigarette smokers”.First, the laboratory model is fraught with the above-described biases. Second, this would amount to a flawed comparison as emphasised before. While a pack (20 cigarettes)-a-day smoker is quite common in society, and assuming the lowest equivalence, are there many narghile smokers who can sit for 10 or 5 one-hour long narghile sessions a day ? As for CO, there is a confusion between chronic and sporadic exposure. For example, independent researchers in Lebanon have shown in a Beirut café (i.e.in a natural environment) that expired CO in exposed non-smokers do not virtually vary (cigarette and narghile smoke alike)(Salameh et al., 2009). 3. Harm reduction.Regrettably, the US-AUB authors did not issue any recommendation (except that of offering their findings to support more smoking bans) that could help reduce the harm caused by smoking in certain conditions. For instance, the charcoal (and particularly the one of the quick-lighting type used in their experiment) should be first lit in the open air and used only after a few minutes. Eleven years ago, out of concern and for the first time in research on this “epidemic”, CO levels were measured in modern hookah lounges. Interestingly, practical conclusions were drawn : particularly by inviting owners of hookah lounges to pay great attention to ventilation (Chaouachi, 2009a). In view of the world craze for hookah smoking and the fact that most of the toxic substances actually comes from the charcoal (El-Aasar et al., 1991b; Daher et al., 2009; Chaouachi, 2009a), perhaps the time has come to stop considering the hookah habit as tobacco use exclusively. The development of an alternative heating system (electrical or other, however responding to inhalation analogic stimuli) was once put forward. In this field of harm reduction, independent researchers have most recently blazed this trail regarding cigarette and hookah filters (Kurien et al. 2009). Harm reduction take-home messages are certainly more efficient than prohibition which often ends up in human and public health catastrophes (Marks, 1994). Becquemin, M.H., Bertholon, J.F., Attoui, M., Roy, F., Roy, M., Dautzenberg, B. (2008). [Particle size in water pipe smoke]. Rev Mal Respir 25, 839-846. Bernstein, D.M. (2004). A review of the influence of particle size, puff volume, and inhalation pattern on the deposition of cigarette smoke particles in the respiratory tract. Inhal Toxicol 16, 675-689. Chaouachi, K. (2009a). Hookah (Shisha, Narghile) Smoking and Environmental Tobacco Smoke (ETS). A Critical Review of the Relevant Literature and the Public Health Consequences. Int. J. Environ. Res. Public Health, 6(2): 798-843. Chaouachi, K. (2009b). Public health intervention for narghile (hookah, shisha) use requires a radical critique of the related “standardised” smoking machine. Journal of Public Health [Springer Berlin/Heidelberg], 17(5): 355-359. DOI: 10.1007/s10389-009-0272-7. Eissenberg, T., Shihadeh, A. (2009). Waterpipe tobacco and cigarette smoking direct comparison of toxicant exposure. Am J Prev Med, 37(6):518-523. El-Aasar, A.M., El-Merzabani, M.M. (1991a). Studies on Jurak Smoke. I. The Organic Constituents of Jurak Smoke. Journal of King Abdulaziz University (Science), 3: 169-181. El-Aasar, A.M., El-Merzabani, M.M. Ba-Akel, H. (1991b). Studies on Jurak Smoke: II. The Metallic Constituents of Jurak Paste and Jurak Smoke. Journal of King Abdulaziz University (Science) 1991, 3: 183-188. Fromme, H., Dietrichn, S., Heitmannn D., Dressel, H., Diemer, J., Schulz, T., Jörres, R.A., Berlin, K., Völkel, W. (2009). Indoor air contamination during a waterpipe (narghile) smoking session. Food Chem Toxicol, 47(7):1636-1641. Kurien, B.T., Scofield, R.H. (2009). Bubbling hookah smoke through heat-solubilized curcumin/turmeric and incorporation of the curry spice as an additive or filter in cigarettes to minimize tobacco smoke-related toxicants. Med Hypotheses, 73(53), 462-463. Marks, J. (1994). Drug Misuse and Social Cost. Br J Hosp Med, 52(2-3):65, 67. Maziak, W., Rastam, S., Ibrahim, I., Ward, K.D., Eissenberg, T. (2008). Waterpipe associated particulate matter emissions. Nicotine Tob Res, 10: 519-523. Sajid, K.M., Akther, M., Malik, G.Q. (1993). Carbon monoxide fractions in cigarette and hookah. J. Pak Med Assoc,43, 179-182. Sajid, K.M., Parveen, R., Durr-e-Sabih, Chaouachi, K., Naeem, A., Mahmood, R., Shamim, R. (2007). Carcinoembryonic antigen (CEA) levels in hookah smokers, cigarette smokers and non-smokers. J Pak Med Assoc, 57(12):595-599. Sajid, K.M., Chaouachi, K., Mahmood, R. (2008). Hookah smoking and cancer. Carcinoembryonic Antigen (CEA) levels in exclusive/ever hookah smokers. Harm Reduct J, 24, 19. Salameh, P., Aoun Bacha, Z., Waked, M. (2009). Saliva cotinine and exhaled carbon monoxide in real life water pipe smokers: a post hoc analysis. Tobacco Use Insights, 2, 1–10. Sanghvi, L.D. (1981). Cancer epidemiology: the Indian scene. Journal of Cancer Research and Clinical Oncology, 99: 1-14. Schulz, T., Dettbarn, G., Völkel, W., Hahn, J. (2009). Water pipe smoking: Biomarkers of exposure. Audiovisual presentation at 14th World Congress on Tobacco or Health (WCTOH), Bombay, 9 March.